The vast array of modern Dining Table Sets that we offer is from the best quality seasoned wood and is embellished with multiple surface patterns that make the range high in demand for clients who value good things of life. 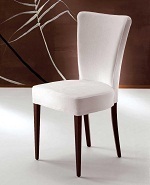 We are engaged in manufacturing and supplying an eye-catchy range of Wooden Dining Chairs. The intricate designs on these chairs give them a classic look. Finest quality wood is used to manufacture these chairs in our state-of-the-art manufacturing facility. Apart from comfortable seating, these chairs enhance the ambience of a room. We offer these chairs in various designs, sizes and specifications. Perfect blend of contemporary designs and robust constructs, wooden dining chairs are competitively priced. Looking for Wooden Dining Chairs ?